The Beantown Bloggery: Twin City Contest - VOTE FOR BOSTON! 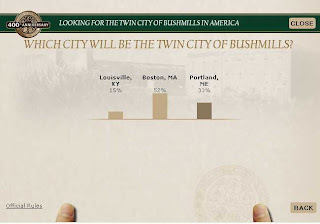 2 Response to "Twin City Contest - VOTE FOR BOSTON!" Wouldn't Boston be a better match for a Catholic town/distillery? Bushmills is considered a "protestant whiskey" in Ireland, if I'm not mistaken. Portland Maine is also a finalist in this competition. I say give the little guys up in Portland some glory. Vote for Portland. They need all the help they can get up there in the hinterland!